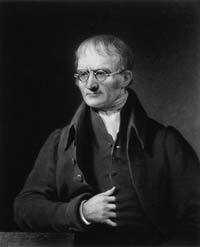 John Dalton was born into a Quaker family, where his father Joseph was a weaver and his grandfather Jonathan Dalton was a shoemaker. Dalton was the youngest child in his family who survived till adulthood. He attended the Quaker Grammar school in the Eaglesfield lead by John Fletcher. When John was 12 years old, Fletcher handed over the responsibilities of the school to Jonathan, John’s elder brother who then called John Dalton to assist him. After teaching in the Quaker school for a couple of years, the brothers bought a school in Kendal and offered various subjects to do with science and math. During this period, John gained some popularity that was enough to get noticed by Elihu Robinson, a rich Quaker who taught him mathematics, meteorology, and other sciences. Dalton was also mentored by a blind person named John Gough, a wealthy merchant who lived near Kendal school. Through their support, John entered the New School in Manchester in 1793 as a teacher in mathematics and natural philosophy. The very next year, he was made part of the Manchester Literary and Philosophical Society. Dalton, being color blind himself, wrote a paper on color blindness, explaining how these people perceive things and why. This paper later became very famous and even the word “Daltonism” was referred commonly to color blindness. Dalton had a great interest in meteorology and the atmosphere. This led him to the study of gasses and forming the atomic theory. He published a paper explaining that when two different gasses were mixed together they acted independently as if the other one is not present. Dalton, also postulated the law of thermal expansion. In the year 1803, Dalton was able to submit another paper, “The law of multiple proportions,” which states that elements always combine in whole number ratios. He created the first table of atomic weights, hydrogen being the first one having a mass of 1. In a way to expand his theory, Dalton published “A new system of chemical philosophy” in the year 1808 which states that atoms of different elements can be distinguished from one another by their varying atomic weights. Thus he became the first scientist to describe atoms behavior in terms of the measurement of weight. He also explained that atoms cannot be created or destroyed. Though Daltons work was welcomed by some people, it received much debate and hype among scientists. However, people began accepting Dalton’s work when more experiments were made on the subject matter in the later years. John Dalton got a small pension from the government that helped him live a normal life. He had a minor stroke in 1837, and yet another one in the next year that affected his speech. In 1844, he had another stroke and died in the same year.